If you’re a CMO or head of marketing, sales and marketing alignment is a hot topic on your agenda. Why? Because marketing leaders are under fire to prove that marketing is a business driver, not a cost center. To do so, you need to ensure a smooth handoff with sales. Those leaders who don’t step up will see performance suffer. According to an Aberdeen study, 74 percent of best-in-class organizations have “complete or strong” marketing sales alignment. This shows that, to stay competitive, CMOs will not only have to develop strategies to support marketing performance, but that of sales, as well. Further, for all the benefits that alignment brings, organizations that don’t achieve it will have a hard time meeting their objectives, notes a separate study. According to the study, a whopping 90 percent of marketers say that lack of sales and marketing alignment keeps them from reaching their marketing objectives. Clearly, aligning marketing with sales is critical to the success of every CMO and marketing leader. Let’s take a deep dive into the benefits, challenges and strategies needed to make this alignment possible. Research by the Aberdeen Group notes that companies that optimize the sales and marketing relationship grow revenue 32 percent faster, as well as see higher growth in brand awareness, average deal size, sales acceptance of marketing-generated leads, attainment of team quota, and percent of sales-forecasted pipeline generated by marketing. There’s no shortage of proof that sales and marketing alignment benefits both teams, and the overall business. However, the road to alignment also comes with its challenges. Although we frequently hear that sales and marketing are at each other’s throats over leads, both sales reps and marketers say their biggest hurdle to alignment is communication. According to a Demand Gen study, 49 percent of sales reps and marketers name communication as their number one challenge, followed by flawed processes and misaligned metrics. When it comes to metrics, 40 percent of sales and marketing professionals place it as their third highest challenge to alignment. 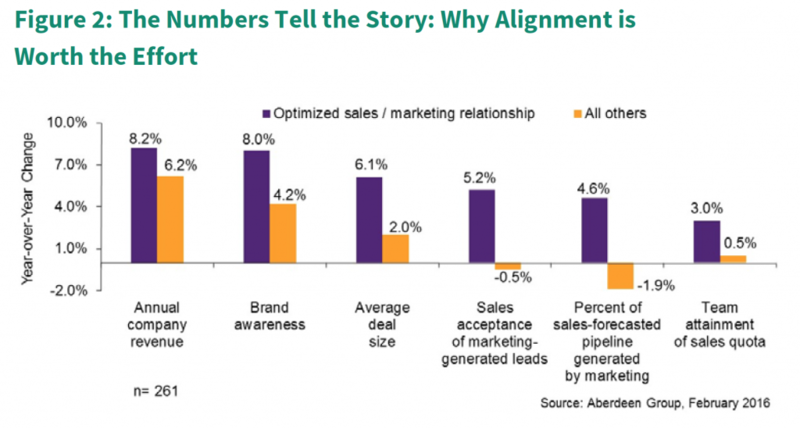 Take a look at the differences in how sales and marketing say they’re measured. For sales, the focus is on gaining new accounts, closing deals, renewals and retentions, and upsells. For marketing, metrics focus on pipeline, lead quantity and quality, as well as brand awareness. Although the high number of marketing organizations that focus on pipeline metrics (66 percent) is a step in the right direction toward alignment, challenges still remain. Here, we’ve put together a few ways to overcome these challenges so you can bring your marketing and sales organizations closer together. So much of the tension that has historically built up between sales and marketing teams points to the fact that these teams typically have different goals and measures for success. 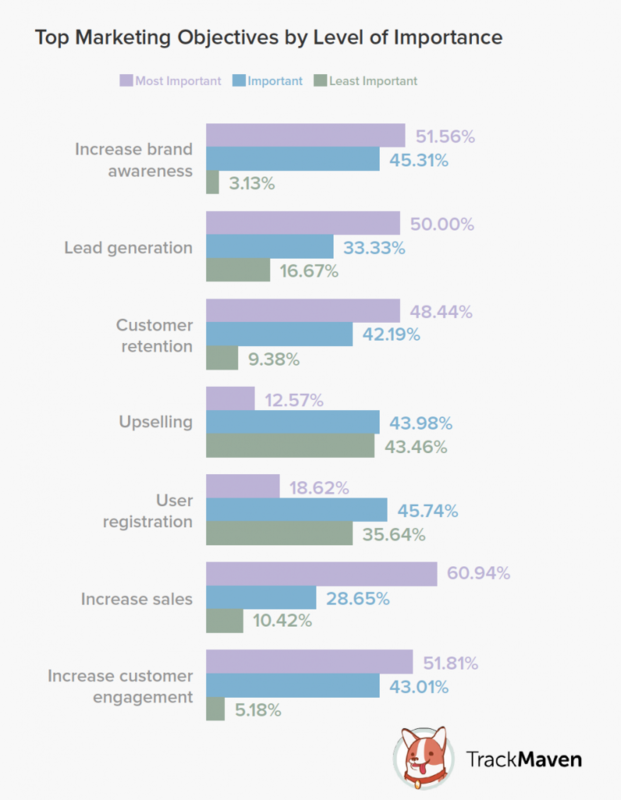 As we saw in the section above, while sales is typically measured on closed deals, new accounts and revenue earned, marketing is measured on brand awareness, campaign metrics and top of lead funnel. To get to that much-coveted alignment, measures for both teams should point to the same end goal: raising revenue. The problem is, most marketers are only halfway there. According to TrackMaven’s 2017 Marketing Leadership Survey, while almost 61 percent of marketers are focused on revenue, stating their top objective is to increase sales, only about half use leads and sales metrics to measure success. Start getting in sync with sales by developing a revenue mindset. Develop joint annual goals around revenue, such as allocating that a certain percentage of revenue come from sales, and another percentage from marketing. You can also make the shift to revenue-driven marketing by focusing on KPIs such as deals influenced, and deals sourced. If you want to find out how your social efforts and content influence leads, for example, you’ll need to understand how each of your channels and posts perform. With a marketing analytics platform, you can use revenue attribution to get a clear view of how your activities are supporting your digital marketing strategy—as well as contributing to the bottom line—moving you one step closer to alignment. Connecting your sales and marketing teams means creating roles and structures that encourage collaboration so that each team is aware of each other’s initiatives and needs, and can work together to reach common goals. Role alignment: The key to structuring your sales and marketing teams for maximum alignment is to ensure that roles defined on both sides of the fence are cross-functional. On the marketing side, take a look at your roles for demand generation, content marketing, product marketing and customer marketing, and define how these roles relate to sales. For sales, analyze your roles for sales development representative and account executives, and make sure you have a function dedicated to lead generation, and another for closing the sale. Marketo discusses this concept, and has some great examples on how to define these roles in this article. 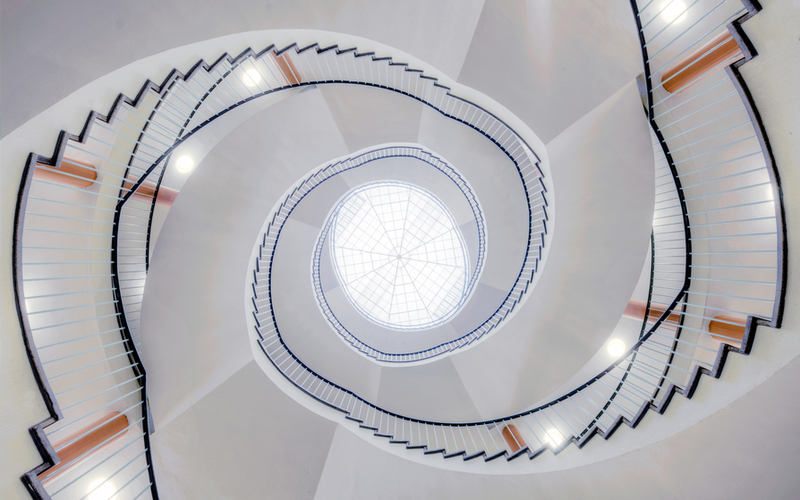 If you’re not quite ready to change your marketing team structure by combining sales and marketing under one organization, you can still create opportunities for collaboration by offering cross-training, as well as encouraging the creation of cross-functional teams for projects like product launches or other go-to-market initiatives. Technology alignment: Finally, connecting your teams through technology is an important way to support and sustain alignment. By integrating your CRM software with marketing software, including marketing analytics and marketing automation platforms, you can ensure that everyone has access to the sales and marketing data needed to view progress and stay on track toward goals. Now that you have your goals and teams lined up, it’s time to focus on compensation. Going back to our 2017 Marketing Leadership Survey, we uncovered another disconnect related to marketing objectives—this time with compensation. Remember that marketers stated their top objective is to increase sales. Unfortunately, only about 23 percent of marketers are compensated on revenue or closed business. To solve this misalignment, you can start by aligning your incentive programs with shared sales and marketing goals and KPIs such as percentage of annual revenue, customer lifetime value (CLV), share of voice and engagement rates by channel. You should also keep those KPIs top of mind by giving your team access to analytics dashboards that let them track how they’re progressing against those revenue-driven goals. Sales and marketing alignment is within your reach. These strategies can help you get there. To find out about more about how today’s leaders are approaching sales and marketing alignment, download your free copy of the 2017 Marketing Leadership Survey today.